When I was a child, my father died in an accident, leaving my mother with nothing but funeral expenses. Soon after that we moved from Canton, Ohio, to Waco, Texas, to live with my mother’s younger sister and her family. We were only able to take with us what we could carry on the train, so I took my favorite doll, a stuffed clown with a celluloid face molded into a permanent smile. Dressed half in red with white polka dots and half in white with red polka dots, Jeepers went with me everywhere. 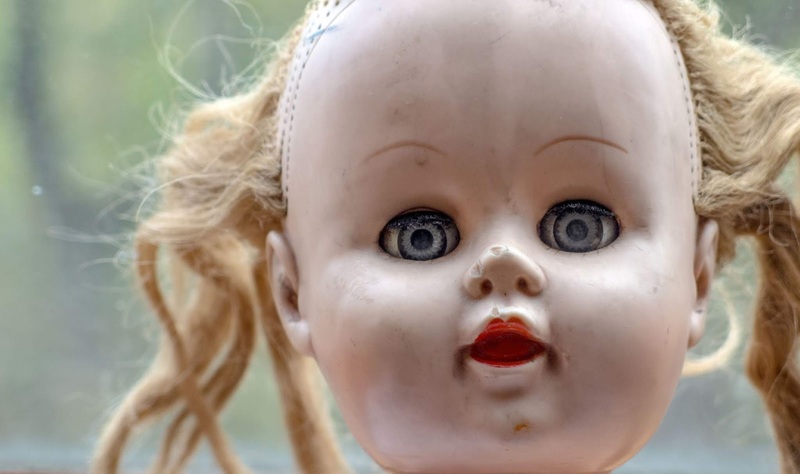 While my aunt welcomed us into their apartment, neither my uncle Fred nor my cousin Darla—a girl a year older than me that my uncle repeatedly referred to as “Dollface”—were as accommodating. My mother and I were given Darla’s bedroom and she was forced to sleep on the couch. Darla and I had never met before our arrival that summer, but she took an instant disliking to me and did anything she could to torture me when our parents weren’t paying attention. The first time Darla hit me hard enough to make tears well up in my eyes, I ran to my mother and told her what had happened. She, in turn, told my uncle, who was home because he did not work. My mother and my uncle stared at one another for a moment, and then my mother grabbed my arm and dragged me into the bedroom. After she shut the door, she squatted so that we were eye-to-eye. She still held my arm and she pulled me close. After my mother finished with me, I remained in the bedroom hugging Jeepers. He knew the truth about what happened, even if he couldn’t ever tell anyone. My cousin’s torture escalated after that as she found new ways to cause me pain with each passing day. I had given up tattling to my mother, even when Darla pushed me down the last few steps of the apartment building and I scraped my face. When my mother asked what happened, I told her I tripped. Darla smiled up at him. My aunt said nothing. She never did. That night I cried myself to sleep while I hugged Jeepers. They spoke as if Darla and I were not present. Two days later, after waking from an afternoon nap my mother insisted I take, I awoke to find Jeepers gone. I frantically tore the apartment apart looking for him, but he was nowhere to be found until Darla strutted into the living room dragging my doll by one arm. I snatched Jeepers from my cousin and ran to the couch where my mother was sitting. As I turned him over I saw that his smiling celluloid face had been torn off. I started to protest, but my mother pushed me off the couch and shoved me toward the bedroom. As I closed the door, I heard her apologize to my uncle for my behavior. Jeepers and I hid in the closet for a long time, hugging and crying and wishing my father was alive and that we didn’t have to live with my aunt and my uncle and my cousin. I wanted everything to be the way it had been in Ohio. I didn’t leave the closet, even though my mother tried to entice me out for dinner and again at bedtime, until well past midnight. I crept into the kitchen, took a knife from the butcher block, and found my cousin asleep on the couch. What I did was messy and took a long time in the dark, but when the adults finally awoke, Darla could no longer torture me and Jeepers had a new dollface. Bio Michael Bracken, recipient of the Edward D. Hoch Memorial Golden Derringer Award for lifetime achievement, is author of several books, including All White Girls, and more than 1,200 short stories published in Alfred Hitchcock’s Mystery Magazine, Ellery Queen’s Mystery Magazine, Espionage Magazine, Mike Shayne Mystery Magazine, and many other anthologies and periodicals. He lives and writes in Texas. Learn more at www.CrimeFictionWriter.com. Excellent! Like something out of Rod Serling's imagination. Well done!